There's something not quite right with the world today, my friend Helen is no longer here; she joined The Church Triumphant on Tuesday. Today she will be laid to rest alongside her beloved husband, Marvin. I can only imagine how joyful the reunion in Heaven must be; for the two of them, and for Helen's precious loved ones who are waiting for her there. Helen was one of the very first people I ever met when we moved to Puerto Rico in 1995. She and Marv welcomed us into Grace Lutheran Church in Santurce, that's the way Helen always was; warm and welcoming, and it's the way she lived her life. When I began teaching beginning quiltmaking classes from our home there, in the winter of 1996, guess who the first one was to sign up? She recruited others and helped them to procure their supplies as well. Helen embodied the spirit of hospitality. She was quick to invite and always happy to offer herself in any way that was needed: a car ride, a meal, a phone call, a visit, a hug, a prayer... you could count on Helen. We used to laugh together over our "plight", being residents of the Island of Not Quite Right... the nickname she gave to Puerto Rico. Don't get me wrong, it's an absolutely lovely place to visit. Living there, day to day, can be another story all together. 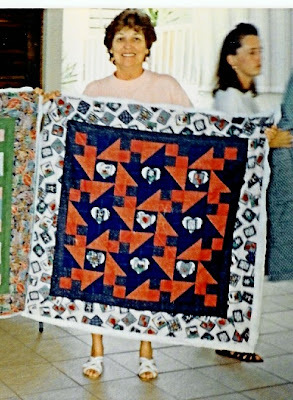 This is Helen in 1996, holding her quilt that she named, what else: "Not Quite Right!" My heart is heavy today; please join me in prayer for her family, I can only imagine how deeply they are grieving now. I am thankful for the happy memories of Helen and the joy and love that she spread so easily... in a way that was always, absolutely, just PERFECTLY right! What a lovely and sweet remembrance of your lovely and sweet friend. A beautiful lady inside and out. I am so sorry for your loss. My heart's heavy for you...so sorry to hear of the loss of your friend. I know she will be missed by many. My deepest sympathies for the loss of your friend... what wonderful memories you have! I certainly will be thinking of you today after reading this lovely tribute to your friend. I am so sorry for your loss. She sounds like such a wonderful lady and will be missed very much --- and also remembered just as much! Offering prayers for her family and prayers for her friends ... what a lovely tribute. I am so sorry for your loss! Finding good, trusted friends is not easy, and to lose one is know true loss. I will be praying for you and for her family! Sending my sympathies on your loss of such a dear friend. So sorry about the loss of your dear friend. Much sympathy to you on the loss of a good friend. Her memory lives on in your heart and she will always be a joy from your time in PR. Hugs! A well-spoken tribute. The loss of a dear friend can indeed be a heavy weight on the heart. God bless you with his comforting spirit. Praying for Helen's family and for you as you mourn your friend. We all need Helen's in our lives, she sounds wonderful. So good for you all to know that she will be with her Father in heaven as well as with her loved ones. Sorry to hear about your friend - but she is happy with her Lord. Prayers for you and her family. A beautiful remembrance of what was truly a beautiful woman. Thoughts and prayers for all who loved her. What a lovely post about your friend. My sympathies to you and to her family and everyone who's life she touched. I wish I had known her too. She sounds as though she blessed many lives, including yours! So sorry to hear the world lost a lovely woman who brought such joy and light to those who knew and loved her--my sympathies. condolences on the loss of your friend; it's always sad to lose someone so important in your life. i envy you for having someone so special.